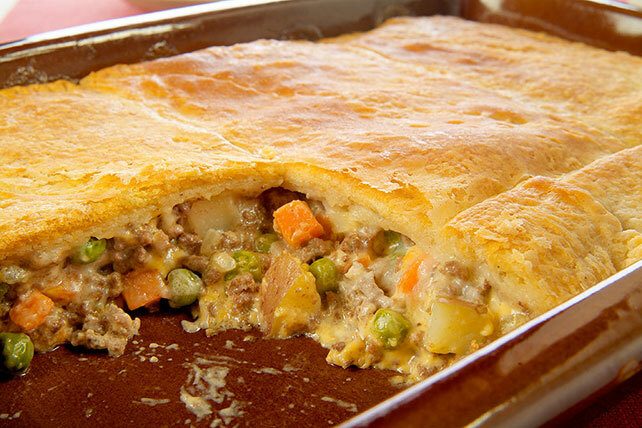 Ground beef and vegetables in a cheesy sauce are baked in a casserole topped with refrigerated crescent roll dough in this easy, weeknight-quick pot pie. Brown meat in large skillet on medium heat; drain. Return meat to skillet. Add onions; cook 2 to 3 min. until crisp-tender, stirring occasionally. Add next 3 ingredients; mix well. Spoon into 13x9-inch baking dish. Melt butter in small saucepan on low heat. Add flour; whisk until blended. Cook 2 min. or until hot and bubbly, stirring constantly. Gradually stir in water; cook and stir on medium heat until mixture boils and thickens. Simmer on low heat 5 min., stirring occasionally. Pour over meat mixture. Unroll crescent dough; separate into 4 rectangles. Firmly press perforations and seams together to seal. Place over meat mixture; seal edges to rim of dish with fork. Bake 20 to 25 min. or until meat mixture is heated through and crust is golden brown. Save 60 calories and 7g of fat, including 2g of sat fat, per serving by preparing with extra-lean ground beef, 2% Milk VELVEETA and refrigerated reduced-fat crescent dinner rolls. Substitute 3 cups of your favorite frozen vegetable blend for the peas and carrots. Substitute 2-1/2 cups cubed cooked turkey or ham for the browned ground beef. Melt additional 1 Tbsp. butter in large skillet on low heat. Add onions; cook and stir 2 to 3 min. or until crisp-tender. Add the meat, peas and carrots, potatoes and VELVEETA; mix well. Continue as directed.